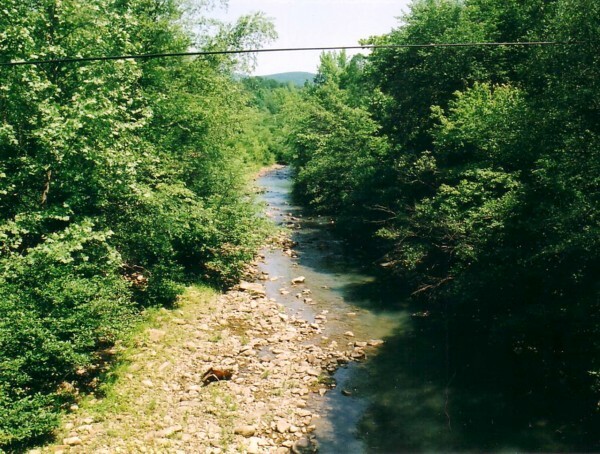 At its headwaters, the Ouachita is a beautiful rocky, mountain stream. 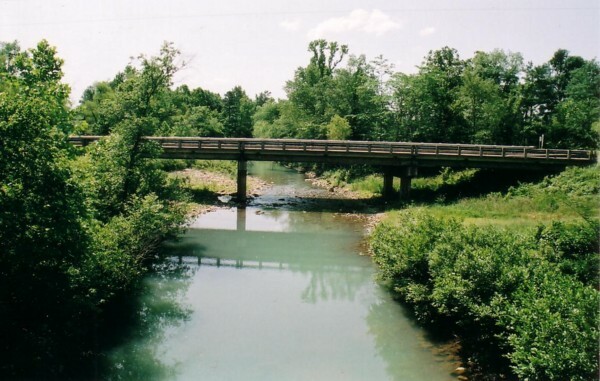 The river begins about eight miles further west on the south side of Rich Mountain. This area is on the south slope of Fouche Mountain in the Ouachita National Forest. Acorn, Arkansas, at the intersection of US 71 and US 270 is at 94.2 longitude and 34.6 latitude at 600 feet above sea level. Round Top Mountain just southwest of Acorn rises to 2507 feet above sea level. The altitude at Eagleton is about 1000 feet. AR SH88 climbs to the peak of Round Top Mountain and continues along the mountain ridge for about 20 miles of scenic mountain road. Queen Whilhelmena State Park is on the mountain about 10 miles from Mena. SH 272 forms a shortcut from US270 directly up the mountain to the park. This view shows the new Highway 71 bridge from the old bridge. The little shoal, or rapids, downstream of the new bridge makes a beautiful view for travelers crossing the bridge. The location of the old bridge is not that evident from the new bridge. Trees on the river bank seem to block the view except from the middle of the bridge. The bridge is at a turn and near the intersection of US 71 and US 270, so it isn't wise to be looking off to the side of the bridge.